Time for some Book Reviews! I know you are here because this is an education blog, specifically science and STEM. But, friends, I am a reader. I love to read book reviews from people I can trust! That's where I get more titles for my never-ending booklist. So, let me suggest a few! This is a beautifully written, lyrical view of World War II France and Germany. It is told in the voices of its two main characters- Marie-Laure and Werner. Marie-Laure lives with her father in Paris and at the age of 6, she becomes blind. To help her navigate through the city her father recreates their neighborhood in a tiny replica she can touch. Several years pass and Nazis invade the city so that Marie-Laure and her father must flee to Saint-Malo. Her father takes a precious jewel with him from the museum in which he worked. This later becomes a major part of the story. Her father recreates the new village in miniature for her. Unfortunately, he is arrested while doing this and leaves her with a relative. In the meantime, Werner has grown up in Germany and becomes part of the advancing army. Near the end of the book, Werner enters Marie-Laure's story and is responsible for her survival. Poignant, heartbreaking, and beautifully told. I found myself turning page after page, afraid of what would happen next to this blind girl. Well worth your time! This is a typical David Baldacci- which means it's a page-turner with action everywhere. You will not want to put it down! It's the story of Amos Decker who suffered a brain injury while playing football. After that, he remembers everything! EVERYTHING! He marries and has a child and then has a tragic thing happen to both of them. Solving a police investigation is the focus of this book. It's pretty fascinating, actually, to read about how he remembers the tiniest of details of things he sees or hears and then can solve parts of the investigation. This was the first book with Amos, but I suspect this will be a new series for Mr. Baldacci! Great, fun read! This is a purely delightful book with amazing descriptions and a great touch of humor. It's the story of 11-year-old Donal who is being raised by his grandmother in Montana in 1951. When she has to have surgery Donal is sent to an aunt's home in Wisconsin. The aunt is bossy and mean-spirited, especially to her husband Herman. In anger one day, Aunt Kate sends Donal back home to Montana on a bus, but to his delight, he finds that Herman is traveling with him. Herman was pretty disgusted with the way Kate treated him and is ready for adventures on his own. Donal is a terrific boy with all sorts of misadventures and Herman adds even more. You will love this book! You will also love this author. His writing style is mesmerizing, full of vocabulary, but always intensely descriptive. Oh, Bloom, what a wonderful memoir by Kelle Hampton. "All I can remember of these moments (when Nella was born) is her face. I will never forget my daughter in my arms, opening her eyes over and over...she locked eyes with mine and stared.....bore holes into my soul. Love me. Love me. I'm not what you expected, but oh, please love me." This book is beautifully written and contains the best photos you will ever see. Paul is a neurosurgeon with a promising career ahead of him. At age 36 he is diagnosed with lung cancer. This is his story- a physician as a patient- told in rich, meaningful prose that will have you turning page after page. It's a quick read and one that will stick with you. It's heartbreaking and uplifting and you will love it. Paul's wife ends the book with an epilog that is equally well written and hers to write since he did not survive to end his own story. Add these books to your summer reading list! 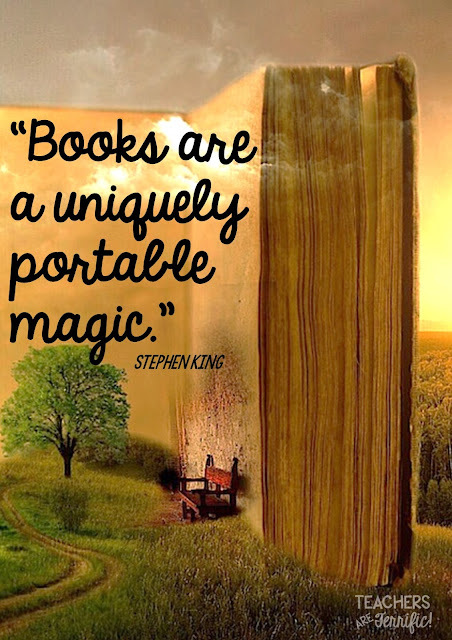 They are definitely portable and definitely magic! Thank you for all of these recommendations! I am starting my Summer reading list and I am definitely going to look into adding these to the list! You are the second person that has recommended Bloom! Glad you found this post! I am thinking about doing this once a month. This is how I find great books and I am always looking for new ones! Thanks for stopping by! What great books! I need to read more! Thanks for sharing this list! My pleasure! I read all the time! In fact, I had three new books delivered to my mailbox today! Thanks for stopping by! I'm always looking for book recommendations! Thanks for a great post. 5 Easy STEM Challenges Not to Be Missed! Catching Those Leaks in the STEM Lab!